Another exclamation point in a year of seemingly endless skyscraper unveilings has appeared on the city’s “to-build list” with a possible rendering of a long-proposed mixed-use tower slated for the heart of NoMad. This exclamatory statement comes from the Mexico-based office of Fernando Romero EnterprisE (FR-EE). Never heard of them? Then check out their website and browse the bold work we New Yorkers too often miss out on. 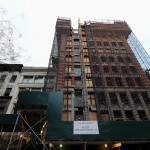 If the selection of FR-EE is official, Ziel Feldman’s HFZ Capital would join a growing list of New York developers bitten by the design bug. Developers like Hines, Rosen, Related, and Extell have led the way in commissioning big name, often foreign, architects to pen skyline-shifting projects aimed at the top of the market. 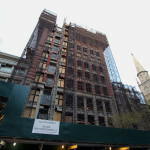 HFZ also commissioned British-based David Chipperfield Architects to design a dignified 30-story tower along the southern edge of Bryant Park. 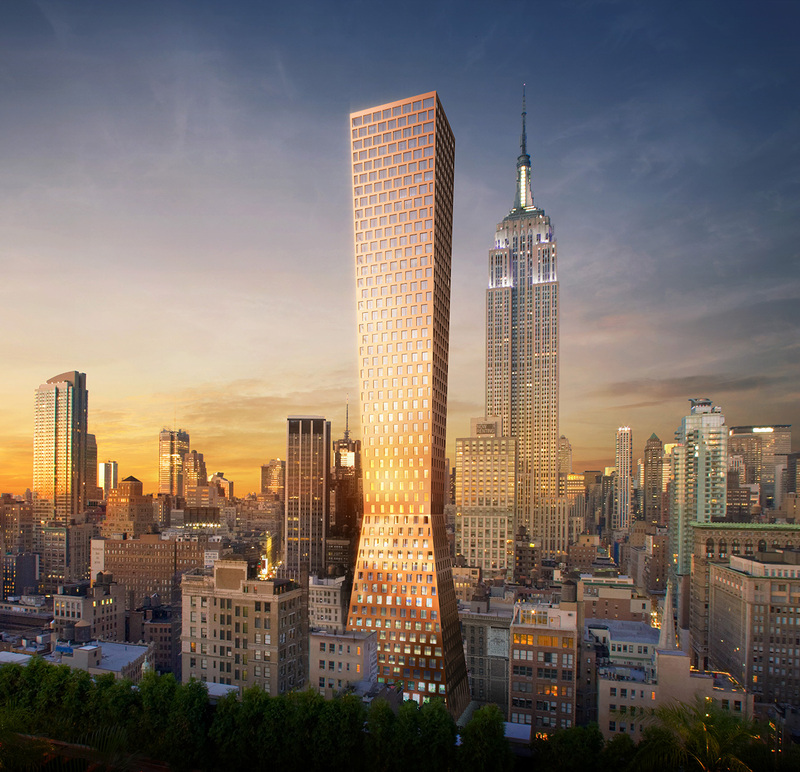 FR-EE’s “NoMad Tower” is one of the firm’s two listed NYC projects and is envisioned for a 25,000-square-foot lot amassed by HFZ and Collegiate Asset Management over the past decade. 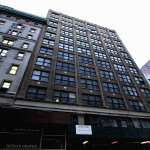 The tower’s mid- and through-block site is situated between Broadway and Fifth Avenue, directly west of the landmarked Marble Collegiate Church on 29th Street. Demolition of the site’s existing structures has already begun, including the ornate limestone and red-brick Bancroft Building which sadly couldn’t utilize enough of the church’s positive thinking. 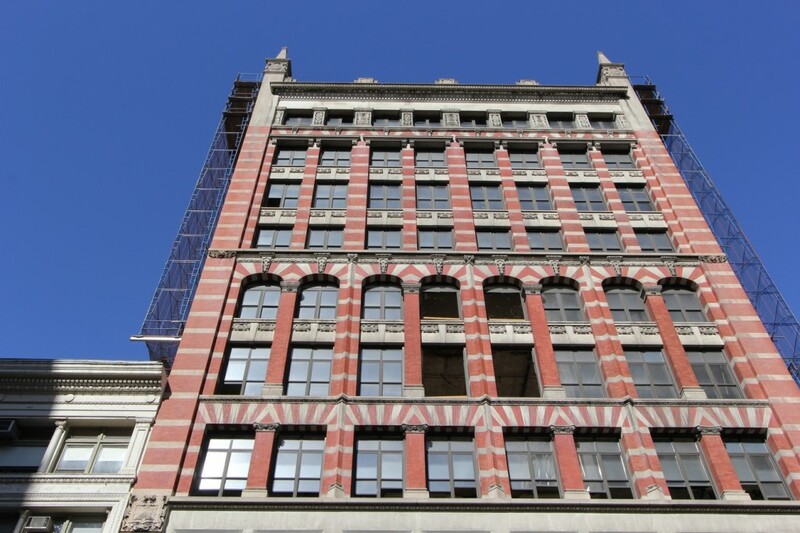 The Collegiate Reformed Protestant Dutch Church sold the building to HFZ last October for $26.2 million. FR-EE’s design lives up to the firm’s name, and seemingly mocks our city’s sometimes stifling zoning ordinances. 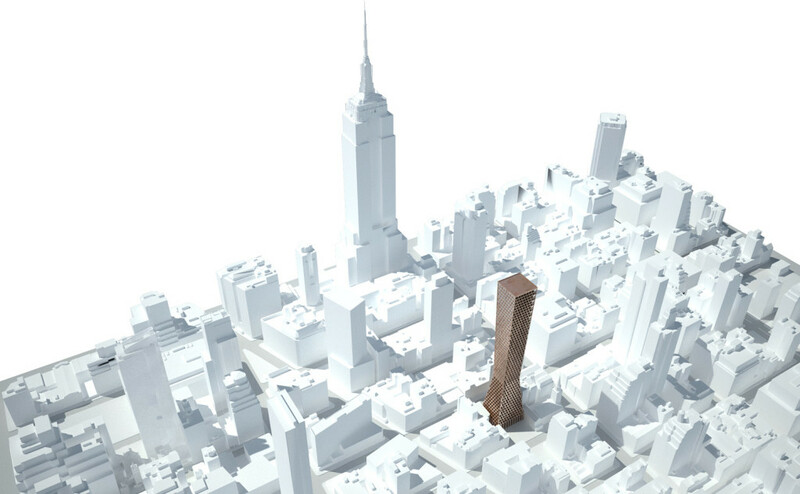 According to the project page, “The pinching of the form in the middle of the tower is a direct reflection of its program,” with lower levels allocated to hotel rooms and upper levels for residential. The 50-story tower frees itself from the street wall and recedes deeply back towards 30th Street with a sprawling public plaza at its foot. The zoning lot lies in the C5-2 and M1-6 zoning districts, a reflection of the wholesale and light manufacturing industries sprinkling the area. The M1-6 district allows a base floor area ratio (FAR) of 10 which can be increased by 20 percent if a plaza is provided. While mid-block towers are usually discouraged by zoning, the tower is allowed to penetrate its sky-exposure planes because of those same street setbacks, thus allowing the tower to sail into the sky as high as the investors dare to gamble. Lastly, the accumulation of unused development rights from the neighboring church allows for an even larger/taller structure to rise. To capture the broadened viewshed from the upper stories, the offset fenestration pattern grows increasingly glassy as the tower rises. The Empire State Building, the city’s ultimate exclamation point (sorry 1 WTC), must be getting a bit uneasy with the ever-growing crowd amassing at her feet. These future-view aerials from CityRealty show that the ESB and HFZ’s tower will have quite a bit of new company. 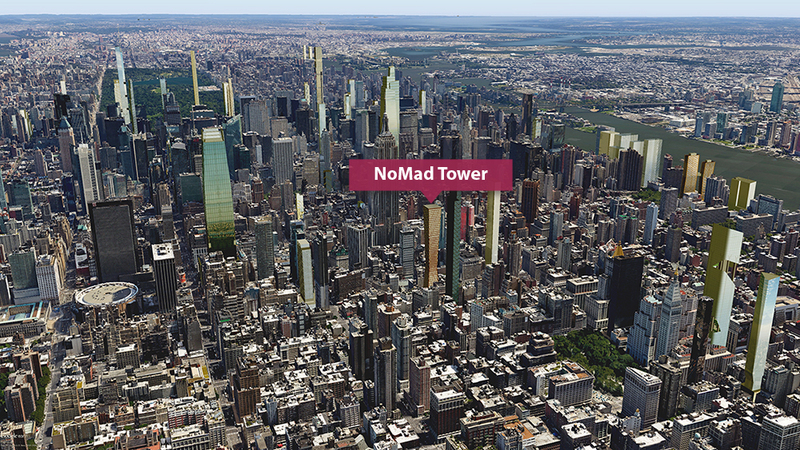 NoMad’s transformation from wholesalers to simply a whole lot of towers is already well underway, with developments such as a 40-story Virgin Hotel, Durst’s 855 Sixth Avenue, and 11 East 30th Street underway. Just last week it was reported that a Russian-Israeli billionaire purchased a development site across from the Collegiate Church for $25.5 million, or $850 per buildable square foot. What does Fernando Romero EnterprisE’s NoMad Tower remind you of most? As the world’s busiest air space grows ever more crowded, with towers poised to register humble neighborhoods onto distant horizons, would it not be more interesting if developers sought to create more memorable building forms like FR-EE’s NoMad tower? The silhouette of the Empire State Building is unmistakeable. 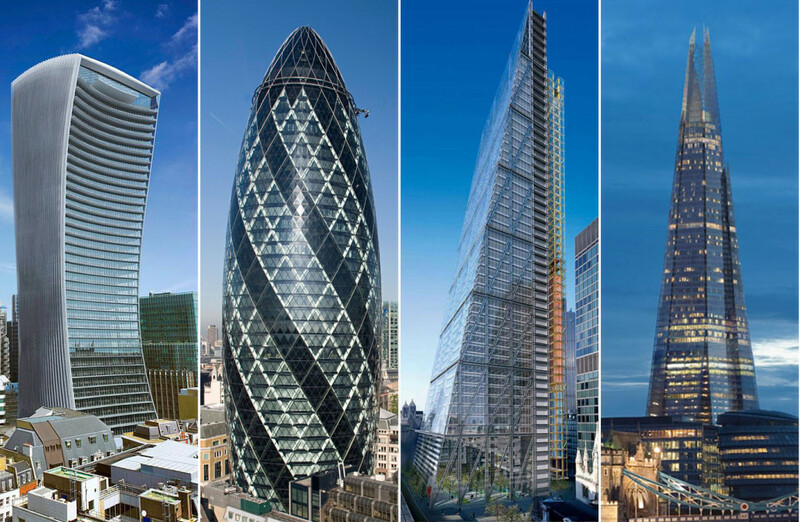 Provocative forms have led Londoners to nickname their towers “the walkie-talkie,” “the shard,” “the gherkin,” and the “cheese grater.” We too have the Flatiron, the Lipstick, the Chippendale armoire (AT&T Building), and soon, “the pyramid.” However, too great a many of our new constructs recall the brick, the shoebox and the filing cabinet. While a city of disharmonious objects may result in Dubai-esque cacaphony, every cake is a bit more memorable with frilly icing and a few candles. Perhaps to the dismay of many community boards and our planning advocacy groups, here’s hoping our skyline gets a bit more accidental and provokes some inspiration rather than gloom. 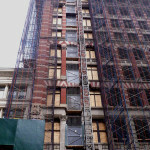 From L to R: Flatiron Building, Lipstick Building, Sony Building (AT&T), FxFowle’s 35XV, BIG’s West 57th.